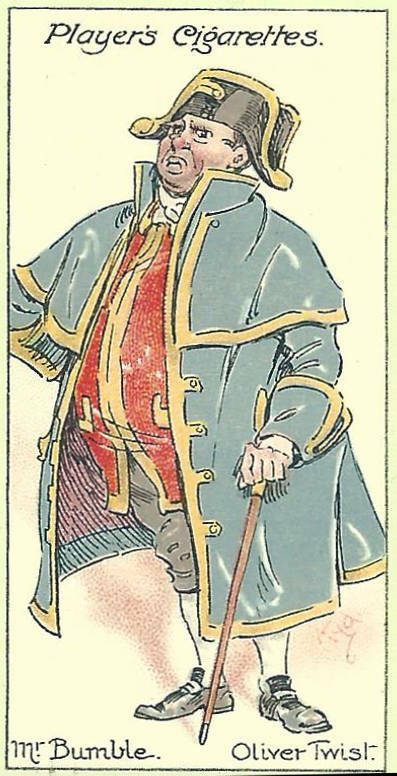 The parish beadle is one of the most, perhaps the most, important member of the local administration. He is not so well off as the churchwardens, certainly, nor is he so learned as the vestry-clerk, nor does he order things quite so much his own way as either of them. But his power is very great, notwithstanding; and the dignity of his office is never impaired by the absence of efforts on his part to maintain it. The beadle of our parish is a splendid fellow. It is quite delightful to hear him, as he explains the state of the existing poor laws to the deaf old women in the board-room passage on business nights; and to hear what he said to the senior churchwarden, and what the senior churchwarden said to him; and what "we" (the beadle and the other gentlemen) came to the determination of doing. A miserable-looking woman is called into the boardroom, and represents a case of extreme destitution, affecting herself — a widow, with six small children. "Where do you live?" inquires one of the overseers. 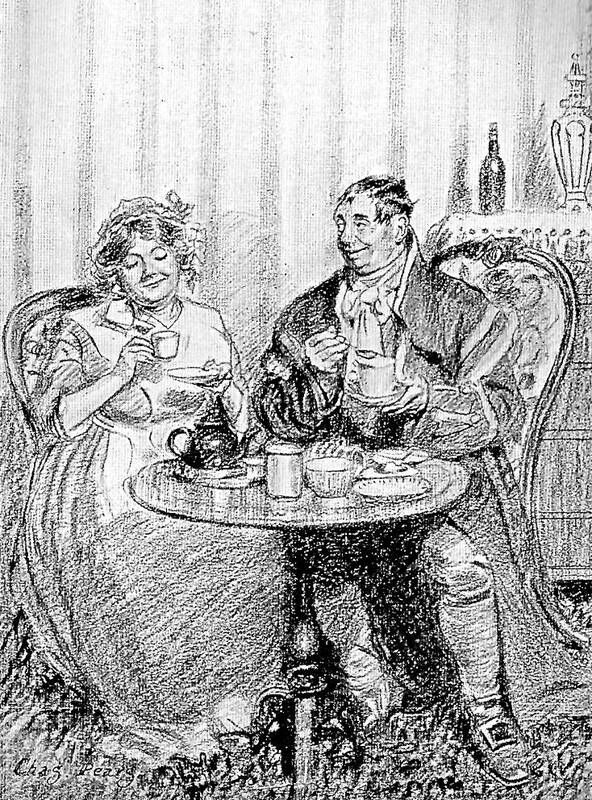 "I rents a two-pair back, gentlemen, at Mrs. Brown's, Number 3, Little King William's-alley, which has lived there this fifteen year, and knows me to be very hard-working and industrious, and when my poor husband was alive, gentlemen, as died in the hospital" — "Well, well," interrupts the overseer, taking a note of the address, "I'll send Simmons, the beadle, to-morrow morning, to ascertain whether your story is correct; and if so, I suppose you must have an order into the House — Simmons, go to this woman’s the first thing to-morrow morning, will you?" Simmons bows assent, and ushers the woman out. Her previous admiration of "the board" (who all sit behind great books, and with their hats on) fades into nothing before her respect for her lace-trimmed conductor; and her account of what has passed inside, increases — if that be possible — the marks of respect, shown by the assembled crowd, to that solemn functionary. As to taking out a summons, it's quite a hopeless case if Simmons attends it, on behalf of the parish. 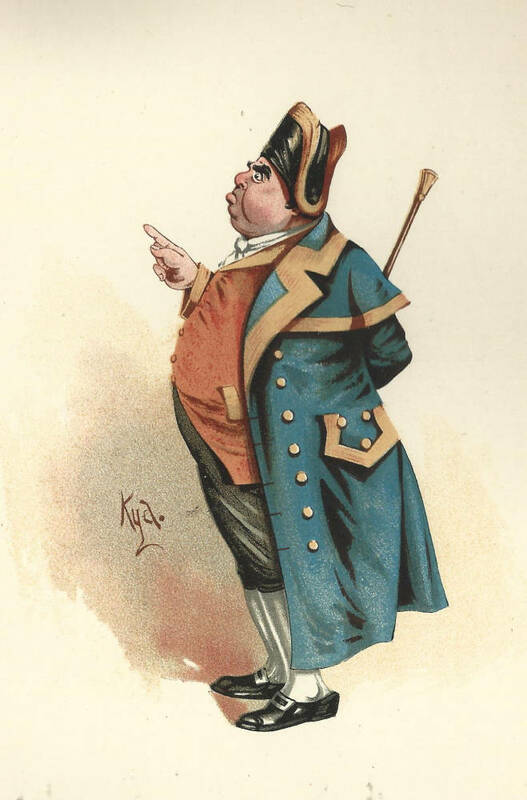 He knows all the titles of the Lord Mayor by heart; states the case without a single stammer: and it is even reported that on one occasion he ventured to make a joke, which the Lord Mayor's head footman (who happened to be present) afterwards told an intimate friend, confidentially, was almost equal to one of Mr. Hobler's. 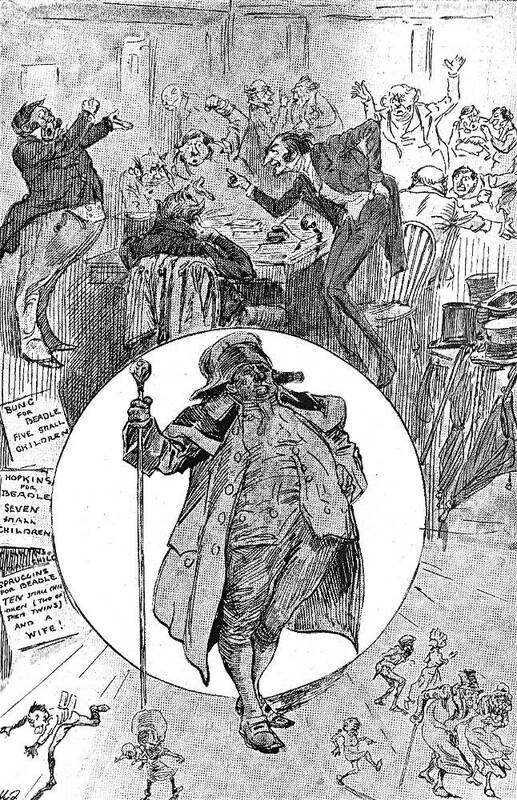 The Paris Beadle as depicted by Sol Eytinge, George Cruikshank, and Harry Furniss. Click on images to enlarge them and to obtain more information about them. 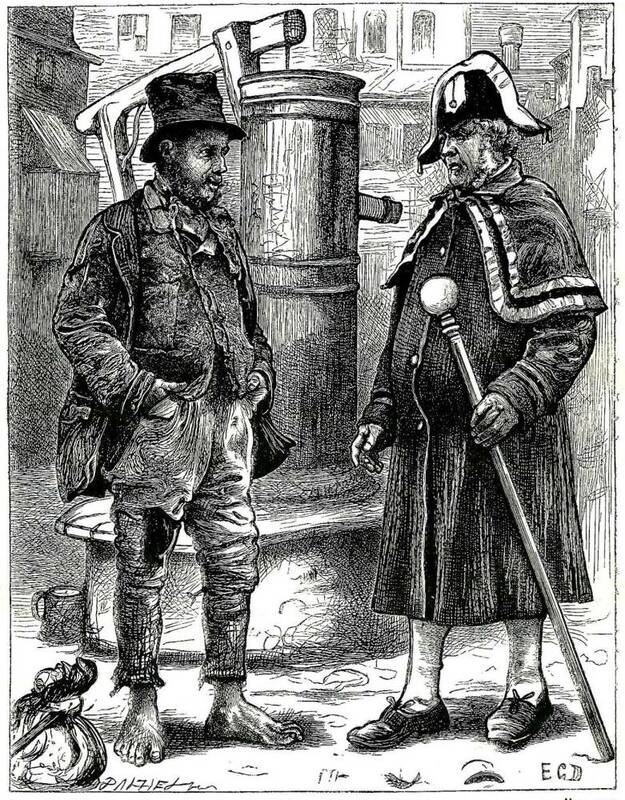 Merely an unpleasant minor figure in Dickens's Sketches by Boz, the local beadle becomes one of Dickens’s most distasteful and hypocritical antagonists in his second novel as the odious Mr. Bumble in Oliver Twist, or, The Parish Boy's Progress (1837-39). 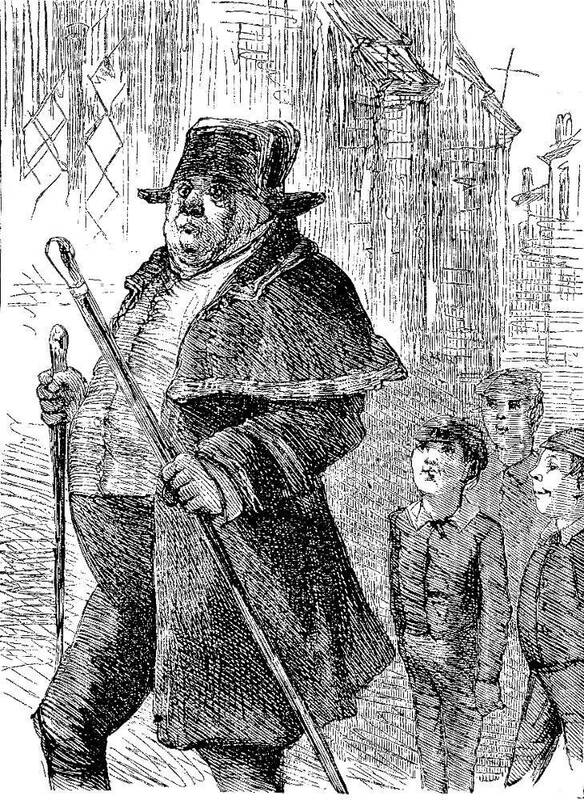 In his gorgeous state-coat and cocked-hat, the beadle in Dickens cuts an awe-inspiring figure who maintains order in the parish and as a civic official carries out duties both religious and educational. 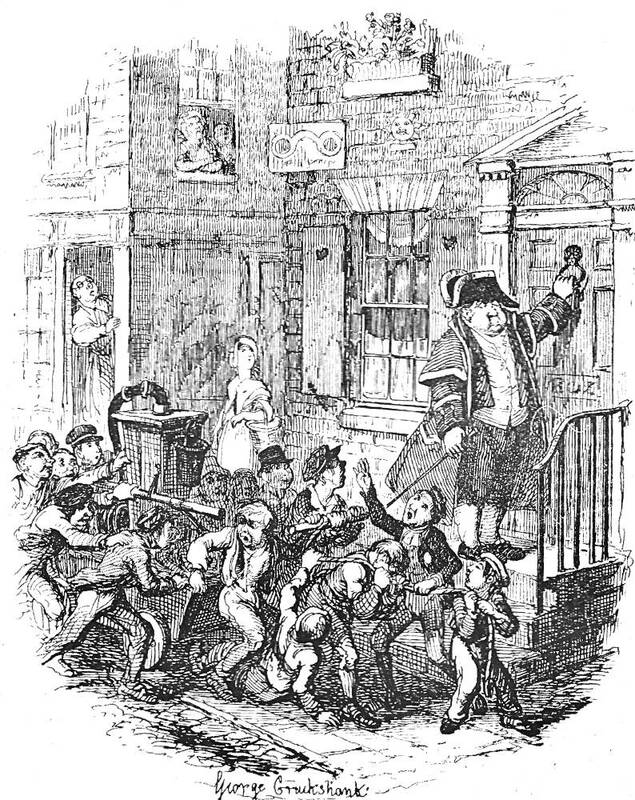 Cruikshank and later illustrators depict the beadle in "Our Parish" as a pompous enforcer of parish regulations — the epitome of the pettiness of local ("parish") politics. 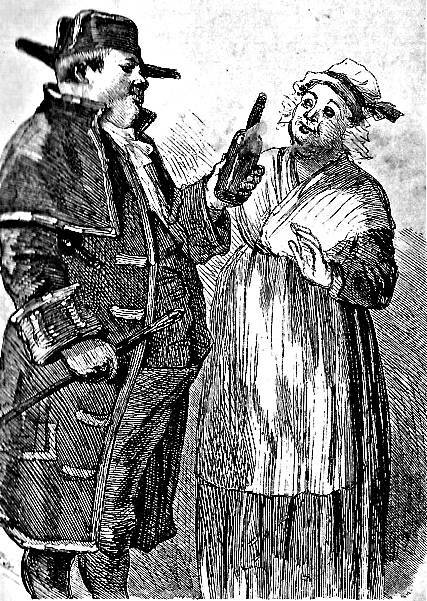 The term "beadle" comes from the Anglo-Saxon "bydel," a herald or messenger from an authority, or a preacher; in Old English the title of the officer responsible for summoning householders to the parish council. 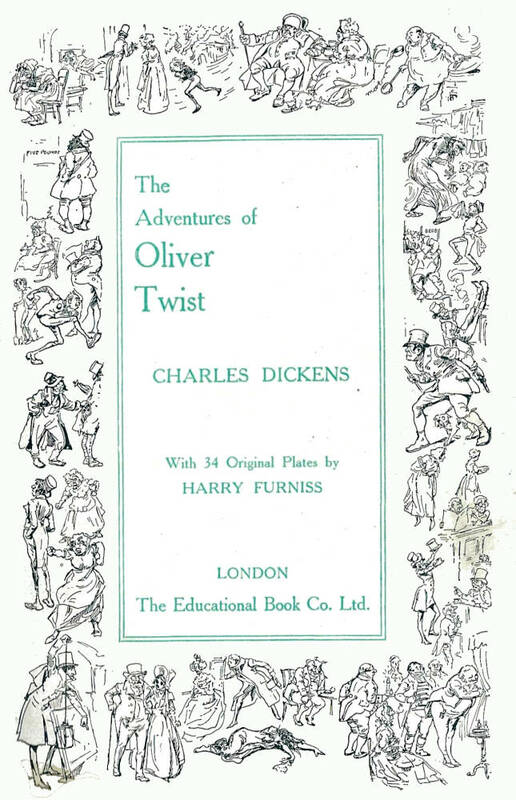 In the novel Oliver Twist, then running in serial in Bentley's Miscellany, Dickens depicts Bumble as the parish constable, overseeing both the workhouse and the orphanage. 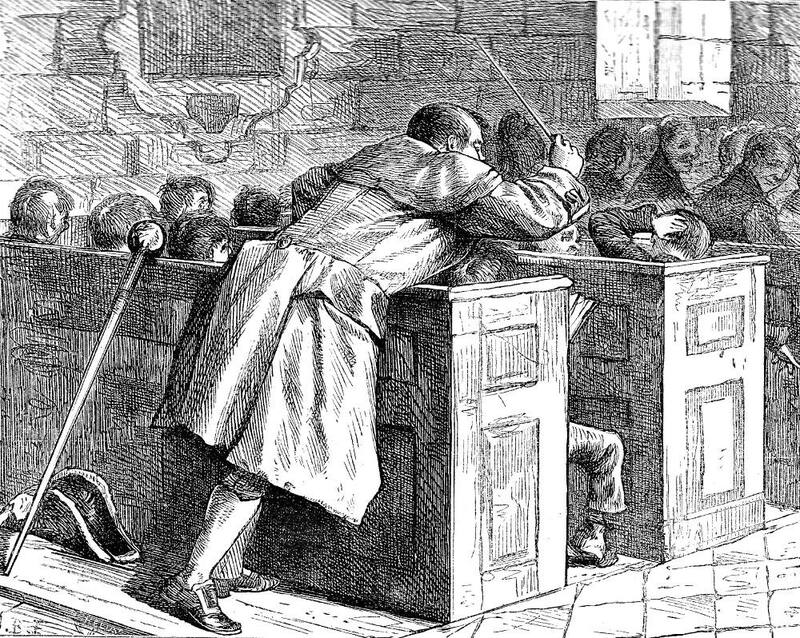 In Frost's 1877 half-page illustration, however, the substantial functionary with the monitory cane serves merely as the reprimander of the bad conduct of errant boys during the Sunday morning prayers in the Anglican Church. Barnard, Fred, et al. 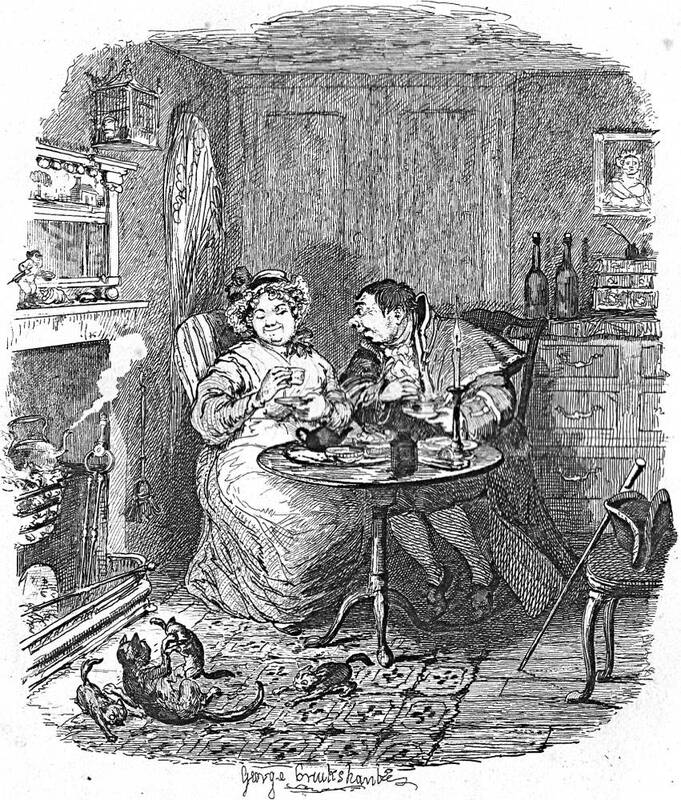 Scenes and Characters from Dickens. London: Chapman & Hall, 1908. Dickens, Charles. Sketches by Boz. Illustrated by George Cruikshank. London: Chapman & Hall, 1836. Dickens, Charles. Sketches by Boz. Illustrated by F. O. C. Darley and John Gilbert. The Works of Charles Dickens. The Household Edition. 55 vols. New York: Sheldon and Company, 1864. Vols. 1-2. Dickens, Charles. Oliver Twist. Illustrated by George Cruikshank. London: Bradbury and Evans; Chapman and Hall, 1846. Dickens, Charles. "The Beadle. The Parish Engine. The Schoolmaster." Chapter 1 in "Our Parish. "Sketches by Boz. Illustrated by George Cruikshank. London: Chapman and Hall, 1839, rpt. 1890. Dickens, Charles. "Our Parish," Chapter 1, "The Beadle. The Parish Engine. The Schoolmaster." Christmas Books and Sketches by Boz, Illustrative of Every-day Life and Every-day People. Illustrated by Sol Eytinge, Jr. The Diamond Edition. Boston: James R. Osgood, 1875 [rpt. of 1867 Ticknor & Fields edition]. Pp. 231-234. Dickens, Charles. "The Election for the Beadle." "Our Parish. "Sketches by Boz. Illustrated by Fred Barnard. The Household Edition. 22 vols. London: Chapman and Hall, 1876. Vol. 13. Kitton, Frederic G. "George Cruikshank." 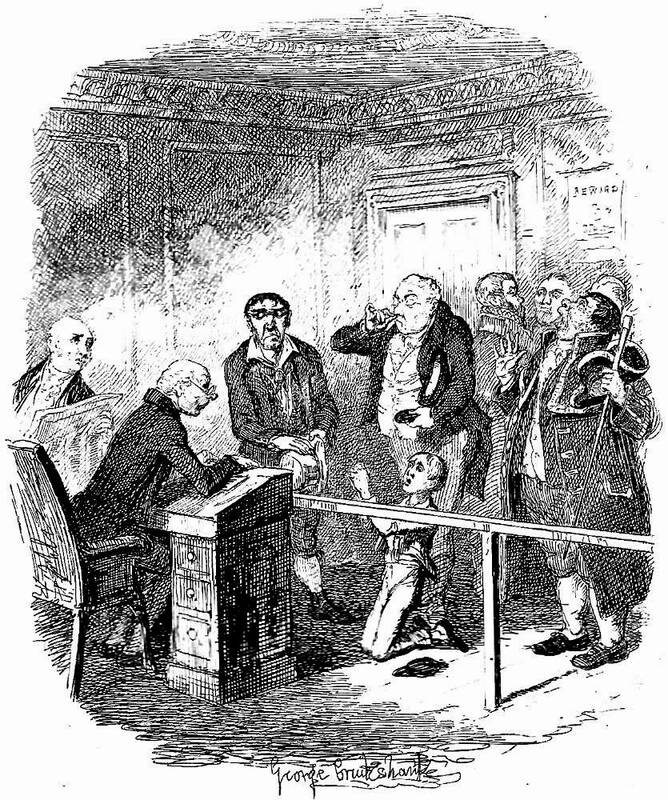 Dickens and His Illustrators. London: Chapman & Hall,1899. Rpt. Honolulu: U. Press of the Pacific, 2004. Pp.1-28.